549 pages | 225 B/W Illus. This book was written because many people are uninformed about zoonotic diseases. This lack of information causes some people to have a heightened fear of zoonotic diseases, preventing them from enjoying wildlife or spending time outdoors. Other people needlessly expose themselves to disease by neglecting simple precautions. This book includes information on bacterial, spirochetal, rickettsial, and viral diseases as well as macroparasites and emerging zoonotic diseases. More than two dozen diseases are covered including rabies, tularemia, baylisascariasis, salmonellosis, leprosy, Lyme disease, Rocky Mountain spotted fever, and swimmer’s itch. Each chapter contains the history of the disease, symptoms in humans, medical treatment, transmission of pathogens to humans, the role of wildlife as vectors, and methods to minimize risk. The diseases people can contract from wild animals can be both threatening and fascinating, and the book includes interesting information to make it more enjoyable to read. 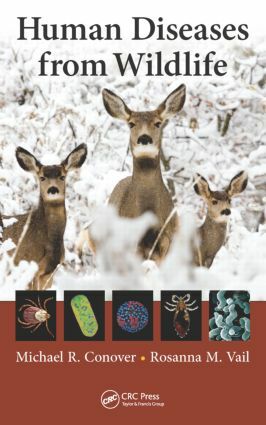 "…a unique compilation of information on more than 70 zoonoses that is likely to become a common reference text among wildlife students and professionals but also should serve as an important resource for hunters, trappers, and other outdoor enthusiasts who are at increased risk of exposure to zoonotic diseases. I recommend this book for anyone that works with or handles wildlife either recreationally or professionally and those generally interested in expanding their knowledge of zoonotic diseases." "This well-written, informative work presents a good general overview of the most common and dangerous zoonotic diseases…. Numerous sidebars present a wide range of interesting topics related to each disease. Medical jargon is kept to a minimum, and though the material discussed is complex, it is presented in a highly readable format that will appeal to readers with a wide range of backgrounds and interests. Summing Up: Highly recommended." "…written in an easy-to-read style and my perusal of sections about which I have no detailed knowledge indicated this was the case….I would recommend this book for libraries in particular, or even individual use for those wanting such a book." "Michael Conover and Rosanna Vail have compiled an extensive array of information concerning Human Diseases from Wildlife, including 4 appendices and a lengthy topical index. It will be a welcome addition to most veterinary, medical, and public health school libraries….It will be an asset for "one health"-related courses, and serve as a ready reference for students wishing to know more about zoonotic diseases associated with wildlife."